Will We Finally Get A Shot At Some Rain Next Week? 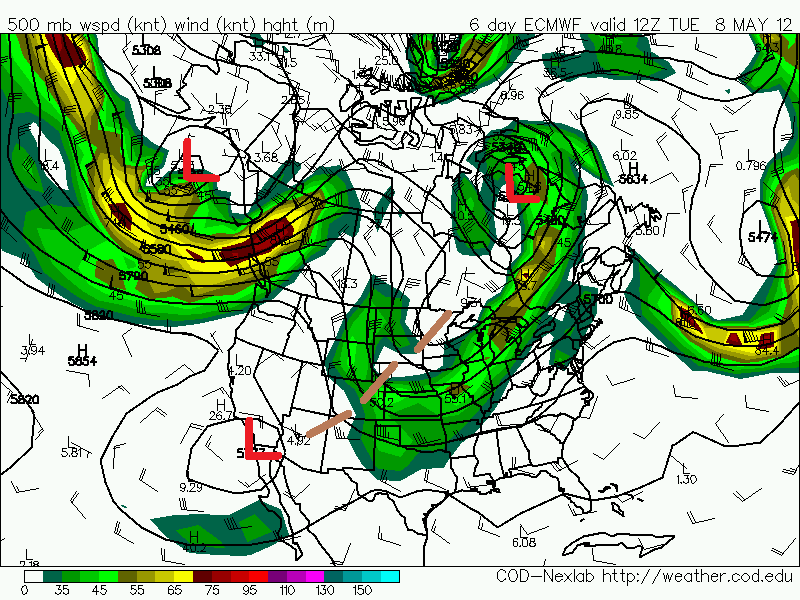 ECMWF 500 MB Forecast At 6 AM MDT Tue May 8, 2012. 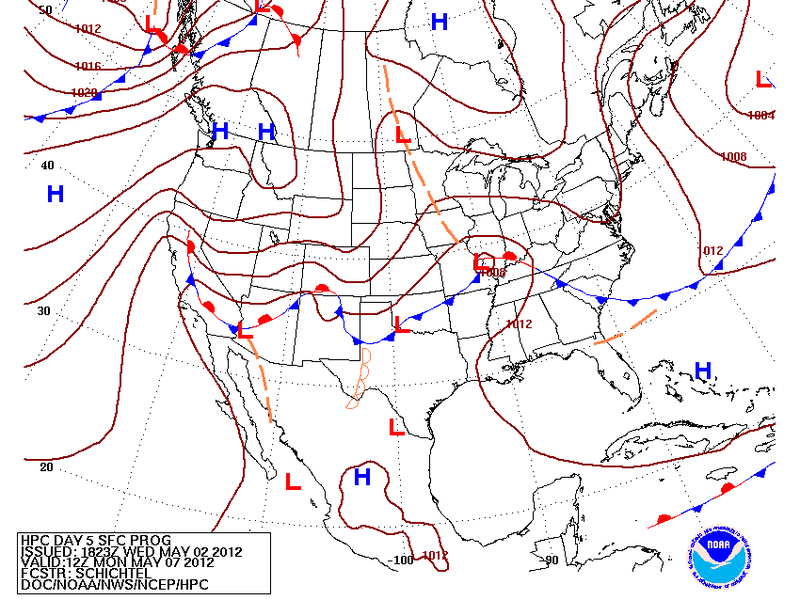 Surface Map Forecast At 6 AM MDT Mon May 7, 2012. 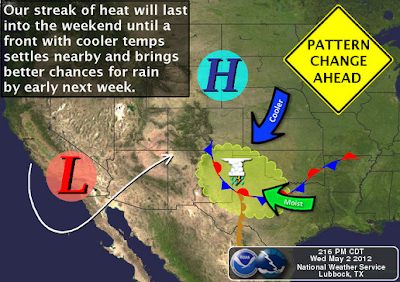 Hot, and very dry weather is forecast to continue across southeastern New Mexico right on into the weekend. 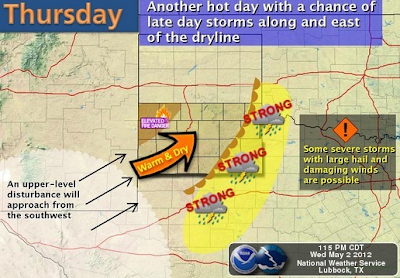 We can expect to see our daily afternoon highs generally in the 95 - 100 range Thursday into Sunday. Don't be too surprised if a few locations top the century mark over the next four or five days. Changes may be on the way late in the weekend into the middle of next week. Although the models haven't settled in on a firm forecast yet, they are hinting that a cutoff upper level low may drop southward into the Baja Region, and then park itself there for awhile. 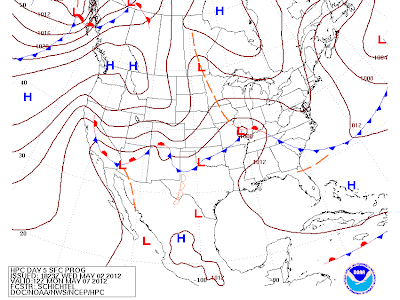 Meanwhile, a cold front is forecast to slide southward down the eastern plains of the state, and then southward into the local area by around next Monday night. While the local area will continue to see above normal temperatures into the weekend, the arrival of the cold front should herald cooler air overspreading the area, which should send our temperatures below normal by the middle of next week. If this scenario pans out then our chances for thunderstorms will increase across southeastern New Mexico and west Texas. Given that it is May, this will also mean that the area will be under the gun for the potential for scattered severe thunderstorms.